Tripp Lite's 0.91 m (3-ft.) gold USB2.0 A/B device cable meets or exceeds USB 2.0 specifications. Connects a USB device to a USB port on a computer or hub. Molded in Ferrite Chokes add additional shielding properties for noisy environments. Backward compatible - can be used with older USB1.1 applications as well. All Tripp Lite USB 2.0 cabling include superior foil shielding for reliable, error-free data communications. The significantly faster data transfer rates of USB 2.0 (up to 480 Mbps) make them perfect for multimedia applications. Features gold plated connectors and gold plated copper contacts for superior conductivity. The cable is manufactured with molded connectors and integral strain relief for extra durability and long life. 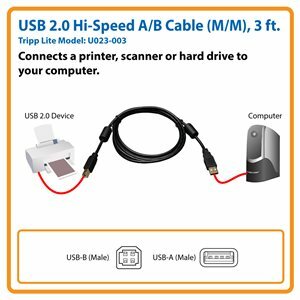 USB 2.0 Hi-Speed A/B Cable, Ferrite Chokes (M/M), 3 ft.
Tripp Lite’s U023-003 connects USB Type-B hard drives, printers, scanners and other computer peripherals to your desktop or laptop computer or a USB hub. Backward compatible with earlier USB generations, this three-foot cable supports data transfer rates up to 480 Mbps, making it ideal for multimedia applications. The molded U023-003 features ferrite chokes on both ends that provide protection from dangerous electromagnetic interference (EMI) that can damage or even destroy your data. Premium foil and braid shielding with twisted 28 AWG data lines and 24 AWG power lines deliver top-of-the-line signal quality. Gold-plated USB connectors with gold-plated copper contacts ensure excellent conductivity. Integral strain relief ensures the cable and connectors last a long time. The U023-003 comes with a lifetime warranty. It’s manufactured in compliance with strict RoHS specifications, reflecting Tripp Lite’s commitment to environmental responsibility.